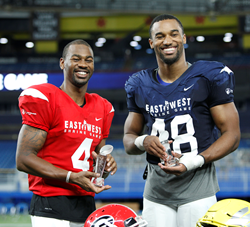 About the East-West Shrine Game: Originating in 1925, the East-West Shrine Game is the longest-running college all-star football game in the country and features some of the highest-rated players in the projected NFL draft ranking. While the teams are divided by East and West, the players come together for the beneficiary of the event, Shriners Hospitals for Children. About Shriners Hospitals for Children: Shriners Hospitals for Children is changing lives every day through innovative pediatric specialty care, world-class research and outstanding medical education. The 22 facilities in the United States, Canada and Mexico provide advanced care for children with orthopaedic conditions, burns, spinal cord injuries, and cleft lip and palate. Shriners Hospitals for Children is a 501(c)(3) nonprofit organization and relies on the generosity of donors. All donations are tax deductible to the fullest extent permitted by law. To learn more about Shriners Hospitals for Children, please visit http://www.shrinershospitalsforchildren.org..